WHY ARE GENUINELY BORN AGAIN PASTORS SO TERRIBLY BLIND AS TO THE PROPHETIC TIMES IN WHICH WE LIVE? Many Cutting Edge subscribers are constantly writing, complaining that, while they appreciate our writings for opening their spiritual eyes as to what was occurring in this world so they could both understand what was going on and better prepare for the planned disasters that are just on the horizon, they were frustrated because their pastors refuse to see the truth! In fact, many of the pastors of this country are not only blind as bats when it comes to properly discerning people and events in the realm of Politics and War, they stubbornly refuse to even consider the truth. Therefore, why do most Christian pastors believe President Bush is a Born Again Christian, when enormous evidence exists that he is Illuminist through and through? Why do most pastors believe the propaganda as to why we went to war in Iraq? Why do pastors refuse to realize the dangerous prophetic times in which we are living, as we are about to lose our liberties from the very President who says he needs these dictatorial laws so he can "fight terror" ? Why are pastors encouraging a hyper-patriotism which accomplishes two Illuminist goals? 1) Encourage young Christian men of the church to join the very military that is fighting a war to produce Antichrist; 2) Encourage all church members to hold this Illuminist government in especially high esteem. Where is their discernment? Why are Christian pastors today rendered absolutely impotent by the propaganda surrounding us, unable -- or is it unwilling -- to see the truth of the events and leaders of the day? Has Satan discovered a way in which he has been able to remove the "spiritual discernment" referred to in 1 Corinthians 2:14, above, so that a Biblically literate leader is totally unable to apply spiritual principles to the leaders and events of today? "... ye can discern the face of the sky; but can ye not discern the signs of the times?" [Matthew 16:3] Jesus was very upset with the Pharisees and Sadduccees, for they were deliberately misleading the people with their words, their actions, and their criticism of His ministry. The Hebrew Scriptures (Old Testament) had given about 300 specific prophecies by which the people would recognize that Messiah was in their midst; Daniel 9:24-26 had given a very specific prophecy which predicted to the day when Messiah would be proclaimed to the people [Read NEWS1751], and yet they still missed the reality that prophecy was being fulfilled and that Messiah was in their midst. The Amplified Bible Commentary adds the understanding, "... because you did not come progressively to recognize and know and understand, from observation and experience, the time of your visitation." Ignorance is no excuse to miss the time of prophetic visitation! Even if your pastor refuses to see the truth, you are still going to be held accountable! One of the major reasons the people of Jerusalem and Israel were physically annihilated was because they did not recognize Jesus as Messiah, even though they had been given such clear and overwhelming prophecies by which they should have known. Also, even though Jesus regularly criticized the Pharisees and Sadduccees for the way in which they mislead the people, Jesus refused to allow the common person to escape judgment because they did not see that Messiah was in their midst. Likewise, today, even though the large majority of pastors are asleep at the prophetic switch and are refusing to listen, you will not be "let off the hook" if you do not recognize the prophetic signs. Conversely, you will be rewarded on the day of the Judgment Seat of Christ if you do recognize the times in which you live, even if your pastor is as willfully blind as the proverbial bat! Discerning the Time of Prophetic Visitation requires a knowledge of Scripture -- doctrine and prophecy -- and a strong willingness to apply that Scripture to Daily Events. Sadly, this is the area in which the vast majority of willfully blind Bible-believing pastors and leaders are failing the people. They do not properly apply their Bible knowledge to the events and leaders of the day. We shall be visiting just a few of these issues in this article, in the interest of time and space. Even though the Apostle Paul stated that he was aware of the devil's devices [2 Corinthians 2:11] so that Satan could not get an advantage over him, he was telling Christians for all ages that they were to be equally aware of Satan's devices. Yet, the Christian Church today does not teach the "devil's devices", to the point that most Christians would not recognize the devil even if he had them by the throat! 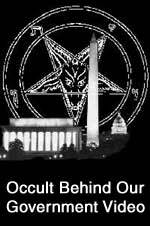 Cutting Edge Ministries has stepped into the gap, studying Black Magick Witchcraft, because that is the prophesied religion of Antichrist [Daniel 8:23-25] and studying the well written occult Plan by which the Illuminati is going to produce Antichrist. All along, we strictly match their plans against prophecy and report that most of their plan does fulfill prophecy exactly. Yet, even if a Christian pastor did not receive one bit of Cutting Edge knowledge, he should know that the End of the Age is clearly upon us, and he should know some very specific facts that he would be able to apply to the events of this day. We are going to briefly study this aspect, and then go into some specific areas of willful blindness. This one verse is one of the most action-packed verses in the entire Bible! For this verse to be fulfilled, a global dictatorial government must be set up that can coerce every person on earth to accept this "Mark of the Beast" as it is commonly called. No one will be given an option; they will have to take this mark or they will be killed. That requires a global dictatorship that can keep very close tabs on each and every person on earth. Thus, when Bible-literate men see two unparalleled global wars break upon the earth, they should have known the time for producing Antichrist was upon the world. When Bible expositors see that each of these global World Wars ended with an attempt to create an Global Government (United Nations), they should have known the prophetic uniqueness facing the world, for a global war had never occurred in the entire history of mankind before World Wars I and II. When we see a resurgent United Nations whose Non-governmental Organizations are passing laws that claim to apply to each nation on earth, we should know that the "time of visitation" is getting very close. When we see RFID tags that can keep track of every person on earth, including what clothes they daily wear and what food they daily eat, we should know the appearance of Antichrist is very close. This verse also demands that the economy be global and the currency be cashless. Therefore, as we look upon the world scene and see an increasingly global economy, and increasing global businesses through merger and/or acquisitions, we should know the End of the Age is upon us. When we see technology able to combine the global political requirements of this verse with the global economic requirements -- the human implantable chip from Veri-Corp -- we should know that Antichrist is very close. Finally, this verse requires a global religion, for the False Religious Prophet is the one forcing this mark upon everyone, and the main reason this mark is being given is so that people the world over can pledge their loyalty to Antichrist. Thus, when we see the Roman Catholic Pontiff leading the way to global religion, we must know that the End of the Age is here. The essence of this understanding is that, when you see events going global, you know the world has entered into a very unique period of history, the point where the preparations are being made for Antichrist to appear. These further signs listed below will also be global and when you see them going global, pastors should know the End of the Age has been entered. Jesus is stating here that the period leading up to the appearance of Antichrist [Matthew 24:15] will take a long time to accomplish. In fact, it will take a very long time. We have seen nearly 2,000 years of history since Jesus spoke this prophecy, so it has really taken a long time to get here. In every era of time, people have spoken up to say that they believe they see the prophetic signs occurring in the day's events; however, other people who knew their Bible have risen up to say that the End of the Age cannot be here, because Israel has not returned to her land, nor have events gone global. Many wars have been fought prior to the 20th Century, but none of them were ever global! Birth of Antichrist will consist of Global Wars, Global Rumors of Wars, Global Earthquakes, and Global Famines. Therefore, when the first global war -- World War I -- was fought, Bible literate leaders and followers should have realized at that moment that the End of the Age was upon us! The First World War was called that because no war in previous history had ever been global! Some of the wars had been very large, with huge battles, and much loss of life, but none had ever been global. Thus it is that at the end of the First World War, the Illuminati signaled to the rest of the occult world that they had successfully completed the first world war of the demonic vision given to Albert Pike as to how Antichrist must be staged [Read full details in NEWS1056]. How did they signal this fact? They arranged for the Armistice to be signed at the 11th hour of the 11th day of the 11th month. Three elements of 11 is a bold, strong signature of the Illuminati. This realization should have acutely hit home by the historic fact that, immediately following the end of World War I, a major push was initiated to give birth to the first global government, the League of Nations! In fact, many Mass Media reports during the last couple of years of World War II used the term, "United Nations" in referring to the nations which had joined the Allied war effort. The Biblically literate should have known that this war was being fought to establish the Kingdom of Antichrist. 1. The End of the Age was clearly at hand. 2. Establishing Antichrist was the end goal. 3. Both World Wars had been fought for the express purpose of moving the world into the Kingdom of Antichrist. This point is major!! Most people have never properly applied this understanding to these two wars. Most pastors and laymen still really believe that the reason we went to battle in both these wars was to "make the world safe for democracy"; specifically, in the case of World War II, most people still believe we went to war to stop Hitler, even though massive evidence has been available to the public for 60 years that proves that Hitler was as much built up by the global Illuminati so he could wage war against him, as Saddam Hussein was built up so we could wage Gulf Wars I and II against him! We shall return to this subject in Part 3 of this series and give much detail. Then, when Israel was reborn on May 14, 1948, all Bible-believing Christians should have realized that the most important single End Times prophecy had just been fulfilled [Read "Miracle of Israel's Rebirth", NEWS1010, and NEWS1706 for full details]. Most Bible scholars have agreed that the clock ticking down toward the End of the Age could not begin until Israel had come back to her land! Against all historic odds, Israel had come back to her ancient land! At this moment, she would never be thrown out of the land again [Amos 9:11-15; Obadiah 17]. Further events leading to the moment Israel would accept her false messiah could begin to occur. Israel is definitely the "fig tree" ["The Cursing of the Barren Fig-Tree" International Standard Bible Encyclopedia], so Jesus is saying that, when we see her beginning to come back to her land ["young shoots become soft and tender and it puts out its leaves"], all other prophesied events in the Bible would occur before a "generation"; as the Amplified Commentary reveals, this word, "generation" literally means the lifetime of people who see the beginning of the shoots coming forth. People of the 20th Century have regularly lived 80-90 years. When did young Israel begin to come back to her land, i.e., "young shoots become tender"? Most historians will tell you that Israel's return to her land was made inevitable by the Balfour Declaration of 1917. If you add 90 years to this date, you will be at 2007; if you add 90 years to the time Israel became a nation, you are at 2038. We believe world events are swirling to the more recent date, but all mankind shall just have to wait to see how events turn out. To reiterate, all Bible-discerning people should have been aware that both World Wars I and II were fought for the express purpose of staging Antichrist on the world scene, just by properly applying their knowledge of prophetic Scripture to the events of the day. Two global wars being fought for the first time in world history that produced history's first global government should have been enough clue. Yet, most pastors remained clueless! When the world entered into that 40-year period known as the "Cold War" -- a time of threatened global nuclear confrontation between the U.S.A. and the U.S.S.R. -- people should have realized that we were living in a "global rumors of war" period! Without any knowledge of the occult plan called the "Dialectic Struggle" -- Controlled Conflicts producing Controlled Change -- people should have realized that a global rumors of war was now following two global wars! In Seminar 2, "America Determines The Flow of History", we demonstrate that the Illuminati created Communism in the first place and that the Cold War was as false as a $3 bill, designed to move the nations of the world into the new "Synthesis" system, the New World Order. When North Korea invaded South Korea on June 25, 1950, Bible believing people should have been alerted by the fact that, even though the United States provided the bulk of the troops and materiel to fight this war, the war was fought under the flag of the new global government, the United Nations! Thus, soon after the establishment of the first global government in world history, that fledgling global government got its first opportunity to wage war. When the United Nations force of 22 nations [Korean War Commemoration, http://korea50.army.mil/history/chronology/timeline_1950.shtml ] fought under the blue and white U.N. flag, every person familiar with prophecy should have known that this war was being fought to produce Antichrist. The Vietnam War is a little more difficult for the average Christian to realize that it, too, was fought to produce Antichrist. However, as we have demonstrated in Seminar 2, "America Determines The Flow of History", this war was fought to produce mammoth changes in American society. The Illuminati wanted to move an entire generation of young people away from Christian values and into a practice of the drug culture, a prerequisite to national witchcraft; these were exactly the societal changes the Vietnam War produced. All 58,000 soldiers who perished, died in vain, for this war was fought in such a way as to guarantee a loss. "This war will not stand, for it threatens the New World Order". From that moment onward, many politicians began to use this term as they sought to explain it. Vice President Dan Quayle, British Prime Minister Thatcher and Russian President Gorbachev began to publicly use this term. Cutting Edge and other Christian groups began to shout loudly and clearly that the "New World Order" was the Kingdom of Antichrist! President Bush, Senior, relied upon United Nations mandates as the basis of his authority to wage war. Immediately after Gulf War I, heads of state traveled to the United Nations to formally establish a permanent military force. Therefore, the Bible-believing Christian should have known that Gulf War I was fought simply to produce Antichrist. Gulf War II was also fought to establish Antichrist, even though President George W. Bush carried out a deliberate Dialectic Struggle with the United Nations [Read NEWS1854 for full details]. President Bush made a great point of ordering the invasion of Iraq through his prerogative as the leader of a sovereign nation, even if that meant going against the "collective will" of the United Nations. Once our Iraq invasion began to move into the phase where people the world over realized it was a fiasco, the original stand of the U.N. was exonerated. When Bush tramped up to the U.N. to beg for more money and general support, many people throughout the world began to believe that National Sovereignty is dangerous to world "peace and safety", and that the United Nations was the preferred governing body. However, at the time Bush ordered the invasion (March 20, 2003], many Bible prophecies had begun to be fulfilled. For the first time ever, the world had an implantable human chip that could go in the right hand or forehead of every person on earth. The global economy was further down the path toward global cashless transactions that are needed to fulfill Revelation 13:16-18. Israel was further down the path to going to war against her Arab neighbors in fulfillment of numerous prophecies. Flowing from the 9/11 attacks, elected governments throughout the world had successfully demanded the most dictatorial powers imaginable, powers not seen since the days of Stalin and Hitler, all in the name of "fighting global terrorism". For the first time ever, laws delivering the required coercive dictatorial powers were passed in nations whose leaders are elected; clearly, these formerly free nations would come under the severe dictatorial powers needed to fulfill this Mark of the Beast prophecy. Finally, technology that will finitely locate and control every person on earth so every person can be forced to show up to take the Mark, sprang into reality. Therefore, each Biblically literate person should have realized that a war in the Middle East at this juncture in history was undoubtedly a war to produce Antichrist. Where are these current American church leaders on this issue? They are basically asleep at the switch, secure in their illusions. Too many of them believe President Bush is a good, Godly man, and few of them have been paying attention to the Good Fruits versus the Bad Fruits of the President. Few church leaders have paid any attention to the reality that, in the guise of fighting terrorism to preserve our liberties, President Bush and Attorney General Ashcroft have demanded -- and received -- extreme dictatorial powers! But, that lamentable fact does not change the reality that current church leaders should have realized that this Iraq war was being fought to produce Antichrist. Therefore, when pastors whip up patriotism to an unusually high level, they are encouraging their people to give strong allegiance and emotional support to the very government that is leading the world into the Kingdom of Antichrist; this situation is akin to trying to get Christians to love the Caesar government that was planning to throw their brethren to the lions, for this government is planning to crush the genuine Christian when the moment is ripe. This hyper-patriotism is also encouraging the young people of the church to join the very military that is fighting to produce Antichrist! If this Junior understood that he was going to war to help the US military fight for Antichrist, would he have been so gung-ho to go? For that matter, would his Christian parents have been so gung-ho for him to go? Yet, here he was, thinking he was doing a wonderful thing by going into the military at this moment in world history, all because his patriotism emotion had been so whipped up. What a tragedy that a Christian pastor who should have known better based upon applying Bible prophecies to world events could not comprehend that the "time of visitation" was close. Therefore, we should expect the leaders of the End of the Age to carry out a very gradual plan whereby they would change the values, attitudes, and conditions of the world so Antichrist can arise to take dictatorial control of the world scene! Common sense tells you that these leaders would not want their citizens to know what they were stealthily planning, so they would travel from Point A to Point Z in a zig-zag manner, even while they publicly fight and quarrel and sometimes even kill each other. But, underneath the surface, they are "acting in harmony" to carry out their gradual global plan! We know that the only way these leaders can act in harmony is if they are agreed upon a plan [Amos 3:3]. By the way, Revelation 17:17 describes what we call a "conspiracy". True Christians who know their Bible should be expecting a global conspiracy to produce Antichrist, not arguing that such a thing is not possible. Global Wars, Global Rumors of Wars, Global Cashless Economy, Global Religion, Global Conspiracy, Global Government forming. This is prophecy, and I have just described in a nutshell the events of the 20th Century! Pastors are without excuse, for they should have recognized the "Time of Visitation"! Without knowing any specifics about the occult, pastors should have coupled current events with prophecy to realize that the world was pregnant with Antichrist and soon to be delivered! And, they should have been preparing the people of their church! And, yes, the last time I checked, those Masonic Egyptian Mysteries symbols were still on the back of our One Dollar Bill. 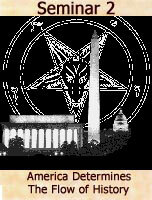 Even though President Bush could have ordered the Treasury to remove those Satanic symbols, he did not. That means the official U.S. government under President Bush is still committed to establishing the New World Order, the Kingdom of Antichrist. Now, let us proceed on to Part 2, to discover how the specific knowledge of the occult that Cutting Edge provides can enable a pastor to see the truth of the period in which we are living. Based upon this brief knowledge of Scripture, however, you can now see that the Bible accurately predicted the major events of the 20th Century and would not have failed the discerning Bible literate Christian. Had this type of Christian properly applied historic and daily events to these Scriptures, they would have realized that the End of the Age and its Antichrist were close at hand.